It has finally warmed up here in northern Maryland and at last it feels like spring! The sun is shining and it is a great day! We got chicks for the first time last month and they are out in the coop & run my husband built. It's a life-long dream come true for me to have chickens and if all things go well we'll have eggs this summer! I realized I hadn't tried any rationing recipes for beverages and I liked the sound of this sunny drink for a fine spring day - Florida Milk Shake. The interesting thing about this is that it uses evaporated (or "tinned") milk along with orange and grapefruit juices and I was absolutely convinced it would taste like an orange cream-cicle. The recipe comes from my fun Lysol Victory Cook Book. I love the little blurbs they put before each section of recipes focused around one of the "Basic 7" food groups. "Citrus Fruits and Tomatoes.... you need them every day." I'm not sure how widely available oranges and grapefruits were through the war for Americans, but I'm sure they were available to some extent. For the east coasters, theirs would have more likely come from Florida, hence the name of the recipe, unlike today where it seems that California produce extends to all four corners of the country. Using evaporated milk would have saved on your fresh milk rations, and frankly the citrus is so strong, I don't think you'd have been able to tell the difference. Not to mention, I think the fact that it's evaporated milk might have something to do with it not curdling when adding the grapefruit juice which is pretty acidic. My chemistry is a bit fuzzy in this area, but that's my guess anyway. The recipe was very simple. Simply combine all the ingredients in a "shaker". I think the recipe is referring to a shaker used in making cocktails? In my case I used my mixing pitcher. Shake or plunge - whatever. In the end, I was surprised that it didn't taste like an orange cream-cicle at all. It was just refreshingly citrus with slightly more body to it than just regular juice. The nutmeg added an interesting spicy element to it too. My kids weren't huge fans, but I liked it. I just love that they have the recipe divided in half for you. It makes my job easier! I made the 3 portions recipe. Because of gasoline rationing, and the use of trucks for war production, citrus fruits would have been hard to come by for the northern parts of the country. Fresh fruit in winter was virtually impossible to get and people dreamed of bananas while others were content with whatever they had/could get. You are right about that! 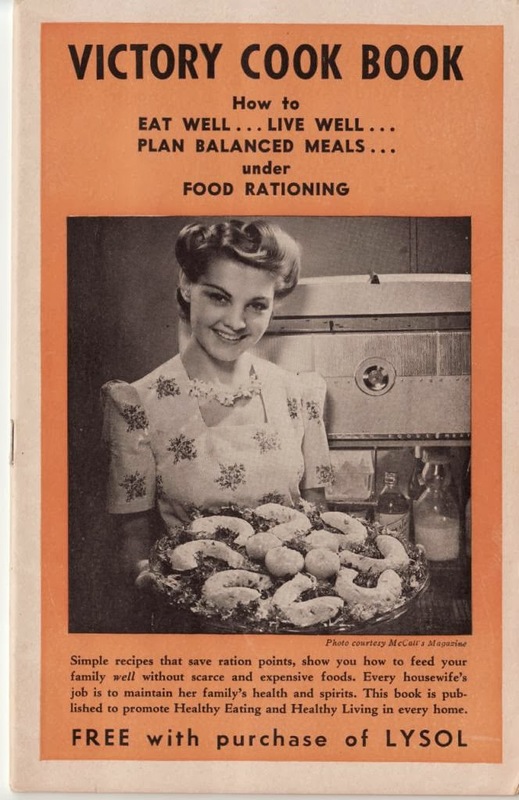 It's one of those funny paradigms of these ration cookbooks that I've come across. There are just some ingredients that some people couldn't get, like citrus and fresh fruit in wintertime. Frozen and canned fruit was an option, but once rationing started for canned goods, canned fruits got to be expensive ration-point wise. One interesting thing I learned was that there wasn't a shortage of gasoline, there was a shortage of rubber, so the government rationed gasoline to keep people from driving a lot and wearing out their tires! Trains were also used a great deal for transporting goods, probably more than trucks for longer distances, but the use of trains for military purposes prevented a lot of food transportation. I think the government did make an effort to make sure that grocery stores were able to get their orders in of what was available, so they could stay in business. Our country is so big and there were so many things that went into supply and demand - It is a really complicated topic!